Lots of companies will create an initial deposit invoice to kick off a project. Here's how Streamtime manages it. Standard practice for creating these kind of invoices include applying a discount to the overall approved value of the job (generally coming from your quote). In Streamtime we have a discount field against Invoices built for this purpose. 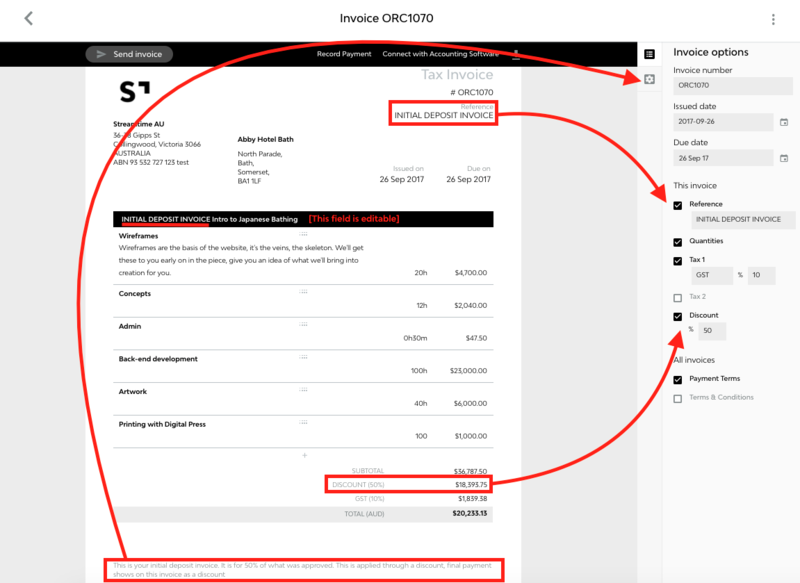 Add the to-be-invoiced amount to the discount field as a percentage. Clarify to your client that this is your deposit invoice. Highlighted below are the best places to mention this. It works well because any accounts sales codes (from Xero or Quickbooks) will still come through to your accounting package line by line and your accounts reporting will be accurate. It's a standard practice way of doing such a thing and preserves your reporting integrity all round. Here's what it looks like in Xero for example.